Taken from the Pictorial Atlas of Lincoln County, 1969. 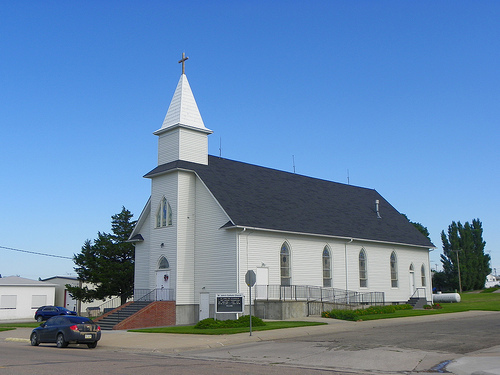 In 1884, the first German Catholics, the John Brosius family, came and settled upon the wind-swept plains of what is now Logan County. A year or so later, more German Catholic families, the Schraders, Beckers, Polzkills, Karns, Walz, Beckius, Kramers, and Santos, came to Logan County and took up homesteads. The first Mass offered in Logan County was celebrated by Father Conway, then a pastor in North Platte, in the sod home of John Brosius in 1885. Later Mass was offered in other homes of those few pioneer families. The early pioneers, realizing the necessity of a place of worship, erected a little church in Gandy in 1886. For many years, owing to the scarcity of priests in Nebraska and the difficulties in traveling through the prairies, those pioneers felt deeply grateful when a priest would come to them a few times in the year to offer the Mass and administer the Sacraments. Every Sunday, when it was not possible for a priest to come and offer Mass, these loyal Catholic families would assemble in the little church in Gandy and recited the Rosary and said other suitable prayers under the leadership of John Brosius, or in his absence, under the guidance of John Schrader and John Polzkill. It would be difficult to give the names of all the priests who came to Gandy in the early days over long distances with team and buggy. Some of them were Fathers Conway and Barrett from North Platte, Fathers Miller and Beinbach from Dale, Father Johnen, assistant from North Platte. The clergy who came to Gandy in later times to care for the spiritual needs of the flock were Fathers Paul Moser from Dale, Patrick McDaid and his assistants, John Gleeson, and J.J. Kavanaugh from North Platte. With the extension of the railroad from Callaway to Stapleton, in 1912, and the building of the new town of Stapleton, a distance of 3 miles from Gandy, the Catholic people decided a new church was needed to accommodate the needs of the growing parish and, consequently, in 1913, under the supervision of Father J.J. Kavanaugh, pastor of Gothenburg, they erected a new church, dedicated to St. John the Evangelist. In the spring of 1914, the first resident pastor was appointed to Stapleton, and for some reason or other, possibly with the intention of building a school, three Spanish priests from South America, Fathers Fernandez, Ballesteros, and Herona, took up their residence in Stapleton. In March, 1915, Father Kampman replaced them as pastor and remained until April, 1917. For a few months afterwards, Father Hynes was in charge of the parish. In the fall of 1917, Father Alphonse Gasser came from Louisville, KY, and his first appointment in Nebraska was to Stapleton, where he remained until April, 1922. For a short time after this, Father Henry Keil and then Father Robert Maron took charge. It was during Father Maron’s time that the debt on the church was paid. IN July, 1923, Father Peter Kenny was appointed to Stapleton. During his stay, the present (1969) rectory was built in 1925. Father C.J. Moynihan came to Stapleton in the summer of 1943 and stayed only a short time. Father Raymond Miles was in charge until Father Louis Nally was appointed in the fall of 19914. Father Vincent Pelster served for a short time in 1947, until Father Neppl came in the fall of 1947. Father James McSweeney was appointed in Aug., 1958, and served until Father Stephen Deaver came in September, 1964. Father John Schlaf, the present (1969) pastor was appointed in August, 1968.